It was a wild, tiring, crazy trip, but the amazing thing about having so many friends is the incredible support they provide. Sometimes I seriously think they could put Wonderbra out of business…and at other times, I’m tempted to give in to the overwhelming desire for us all to just quit grad school together and start our own company called WonderBrowse, the book fanatic’s haven and bookshop. Serving up double-D-good lit and baked goods (because you know we’ve got to worm those in there somehow) since the 300th anniversary of Pride and Prejudice, 1st ed. (yes, that’s 1813!). And the Queen of Digression strikes again. Of course, I’ve never been one to stay in one place for long twiddling my fingers–I am most definitely a work-hard, play-hard kind of gal. And, well, thanks to my very good friends, this trip witnessed the epic collision of playing and working. 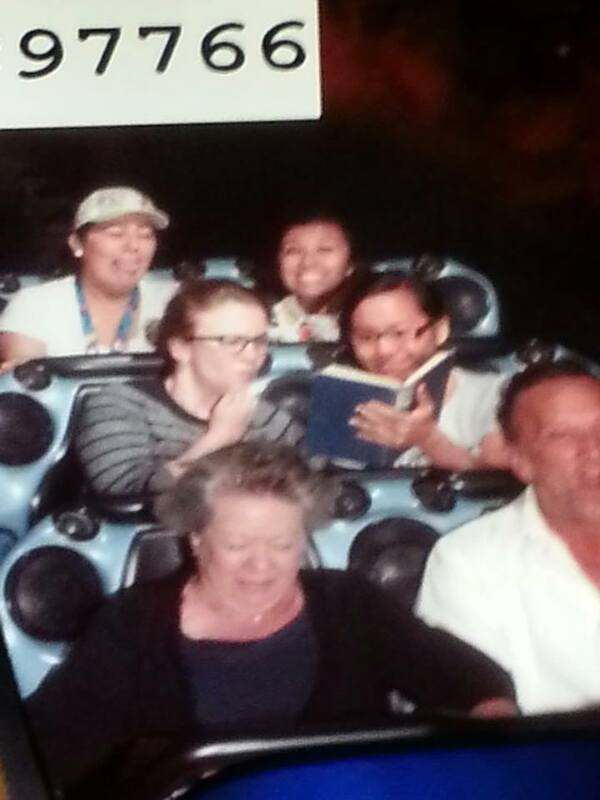 Reading Out of This Galaxy: Two English grad students poring over an epistemological novel on Space Mountain, Disneyland. Please note that the upside-down-ness of the book does not affect our ability to comprehend it–in fact, it actually augments our appreciation for the novel’s epistemological crisis. We even donned our hipster glasses. 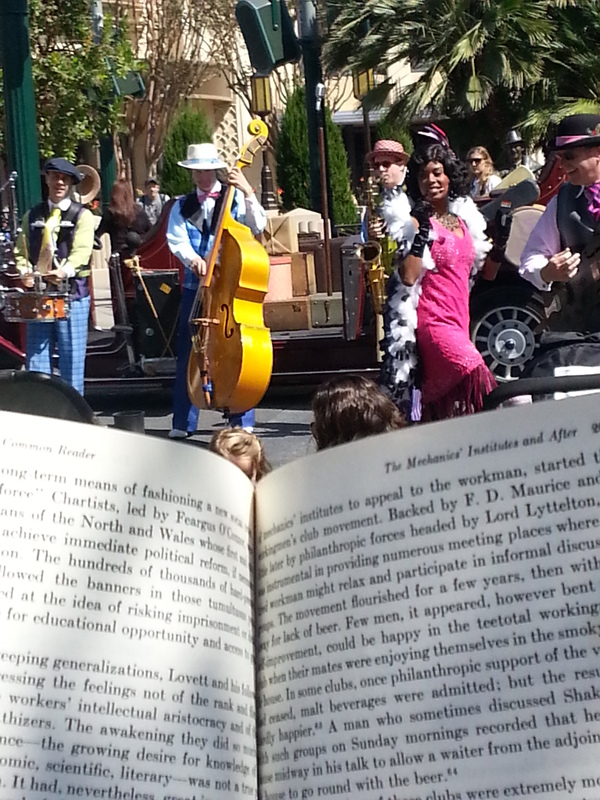 Outside the Lines: We stayed at the fountain in Disney’s California Adventures reading for nearly four hours. During that time, we were winked and waved at by dozens of performers who kept coming back to the spot–one friendly worker even came over to inquire about what we were studying! A perfect moment in time and place. 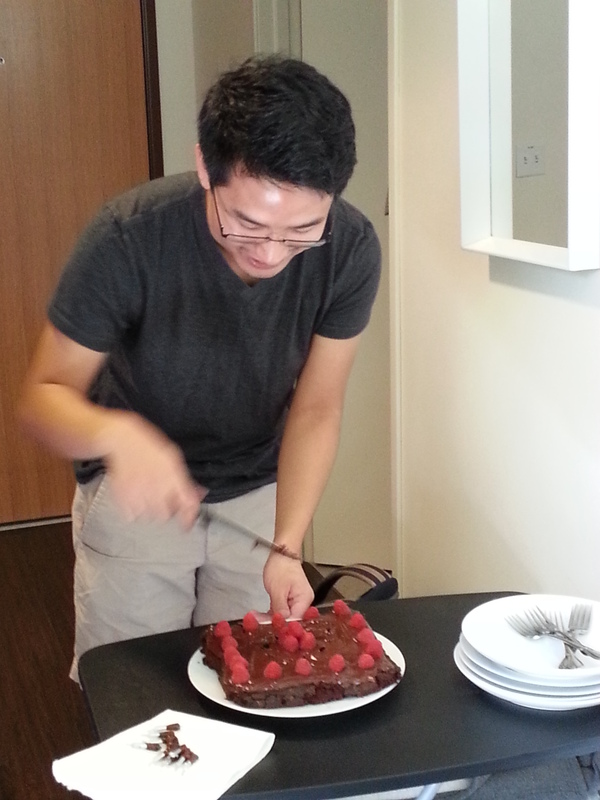 A Sweet Surprise: Despite not having my own oven for the full two weeks, I was still able to get my bake on at least four times during the trip, including for my friend’s favorite dee-lish chocolate birthday cake! CAMERAS, SUN, INACTION! Did I mention the day I spent with a friend reading at the beach and getting massages afterwards? We even stopped by an adorable place called Lenny’s Diner on our way back to his place for the night, and had the most amazing matzo ball soup. Literary theory and beach bums. Before I left for my trip, though, I made sure to step into my kitchen and whip up a batch of perfectly transportable, perfectly storable sweet treats for all of my hosts. These were probably the most popular cookies I have ever baked and distributed among my unsuspecting guinea p–I mean, my friends. And the best part is, it’s an original recipe! 1. Cornstarch: Believe it or not, the addition of this strange ingredient prevents cookies from getting too crumbly or dry. 2. Underbaking: Allowing cookies to finish baking on the cookie sheet on the stovetop rather than in the oven keeps them nice & chewy! 3. Brown sugar and extra cookie butter: Using LOTS of brown sugar gives these cookies a great, soft caramelized texture and taste, while swirling in an extra generous dollop of cookie butter before baking keeps them gooey and chewy. 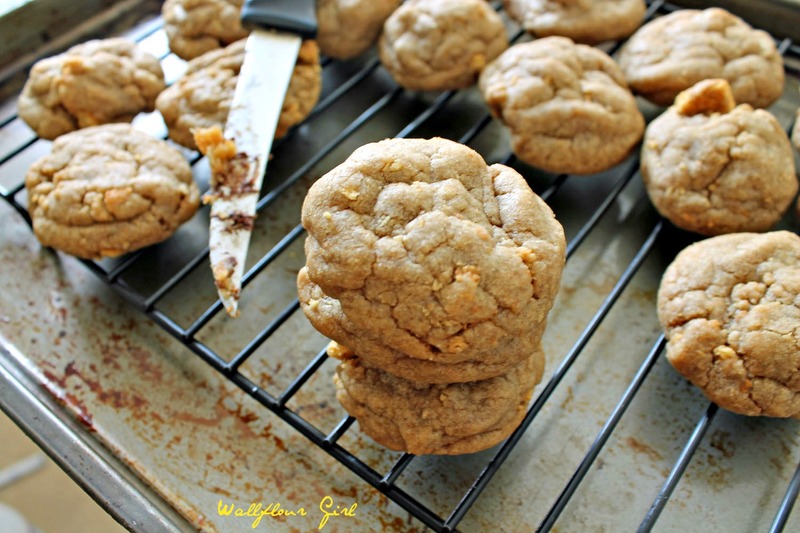 You might even fold an extra spoonful of cookie butter into each cookie dough ball before baking, like I did with my Best Biscoff Chocolate Chip Cookies! Whether you’re embarking on a long voyage like a Senior Wilderness Explorer (there is, by the way, a really fun story that I will save for next time’s post!) or simply looking for a simple way to leave your friends more impressed than an 18th-century English navy sailor, these perfectly chewy cookies are it. Print this! Off to rest up–these two weeks really did take a toll on me. Whew! See you on the flip side of lucidity! Adapted from my Best Biscoff Chocolate Chip Cookies and Best Chewy Biscoff Chocolate Chip Blondies recipes–check them out! In a large mixing bowl, cream together butter, 1 1/4 cup cookie butter, and both sugars. Beat in egg, egg yolk, and vanilla, until well combined. Add dry ingredients (flour, cornstarch, cinnamon, baking soda, salt, and nutmeg). Stir into wet ingredients until just incorporated to avoid dry or stiff cookies. Note: Your dough will be very crumbly at this point. Just keep working with it! If you have trouble holding it together, add a bit of margarine or butter in teaspoons until the dough comes together, but avoid adding too much or the taste of the recipe will change. Gently fold in melted 1/3 cup cookie butter and chopped graham crackers. 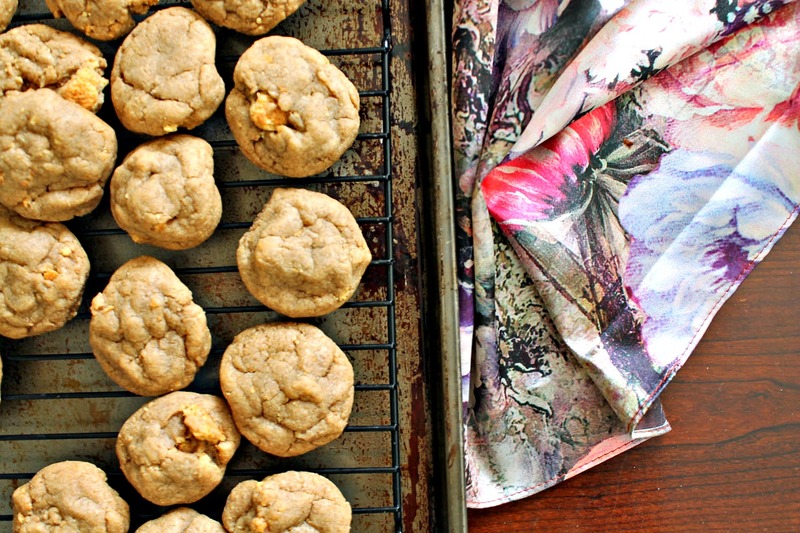 You’ll want to swirl gently in order to keep nice cookie butter ribbons in your cookie dough. Roll dough into 1-inch balls and place them, evenly spaced, on prepared cookie sheet. Bake in preheated oven for 8-10 minutes, until edges are set but centers are still nice, fluffy, and slightly gooey. Remove sheet from oven and place on stovetop so that the cookies continue to cook on baking pan for at least another 10 minutes. This last step is important, and will ensure that your cookies are both fully cooked and chewy! Sounds like you’ve been having a fun (and productive!) time. More fun, less literary theory, I say. (Literature is good, But much of literary theory? I’d rather go to the dentist.) Good recipe, fun post – thanks. Aw yeah, super productive! Although I’m on my last stages of that monster Vanity Fair at the moment, so we shall see how the scores tally up today. Thanks, John! Oh, you betcha 😉 thanks for reading! These cookies look so delicious!! Love the brown sugar + graham cracker combo. My sweet tooth totally agrees with you–thanks for stopping by and reading, Rachel! These look great! 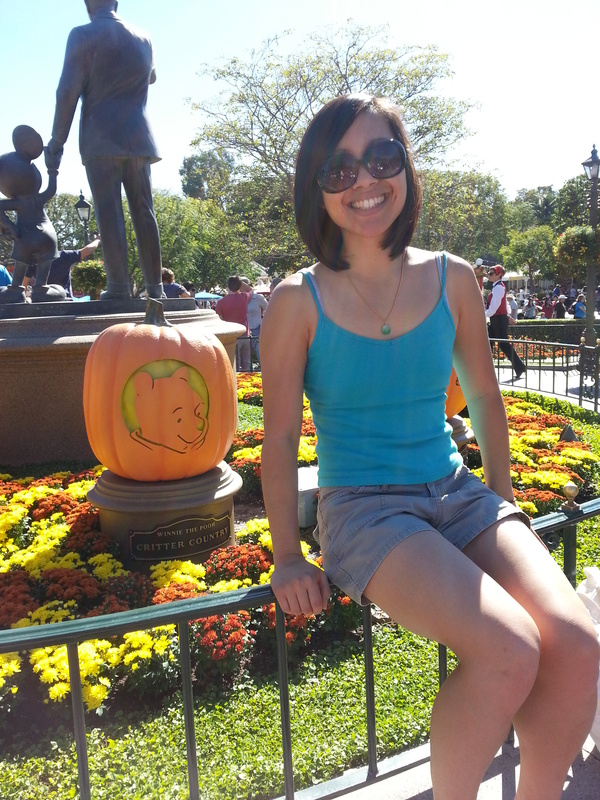 (And I love the Disneyland photos) I’ve never tried cookie butter…I think I’m going to have to remedy that when I get my next paycheck. In the meantime, how do you think peanut butter or almond butter would work in place of the cookie butter? Too oily? Tifa, you most definitely need to jump on board this bandwagon–although I think peanut butter should make an excellent temporary sub in this recipe (can never have too much PB, either!). If you do get a chance to try it, I’d love to hear how it goes! Ok, this cookie seems way too dry followed instructions exactly is it supposed to resemble crumbs, I read before I made, I read as I made, I read after I made, and I bake alot of cookies, help me salvage this recipe, please, thanks in advance. thank you so much for getting back, I was so looking forward to this recipe as yours stood out. The final product was dry it resembled the crumb texture for a cheesecake, would not keep its shape. I don’t believe I overmixed as I was using a hand blender, it started out great, until the addition of the flour. That is why I came back to see if there were any comments of people having any problems and could not find, so I thought maybe it was maybe a misprint. I tried adding some water, but I would have to add way to much, it is still in the fridge, just can’t bear to throw it out, any suggestions, I am thankful! !